The importance of calligraphy gave inscriptions a far greater role and status in Islamic culture than in contemporary Europe. On a monumental scale, excerpts from the Qur'an were cut in brickwork to become three dimensional elements of buildings, or rendered on tiles as a lustrously colourful surface. In addition to their decorative effect, such inscriptions often give clues about the function and meaning of Islamic architecture and objects. Many types of artefact include specifically religious or more generally moral phrases. Blessings for anonymous owners were common on metalware and ceramics, suggesting that they were intended for sale at market rather than specially commissioned by an individual patron. The surfaces of scientific instruments provided a medium for such pious adages. An instrument intended specifically for a ruler might have a different celebratory and propagandistic purpose, and carry a bombastically lengthy inscription with the patron's many honorific titles. There is one inscription peculiarly appropriate for astrolabes. One of the best-known passages in the Qur'an is the Throne verse (2: 255). This is used, for example, to surround the highest point of the dome in many Ottoman mosques, and appears in numerous other contexts. 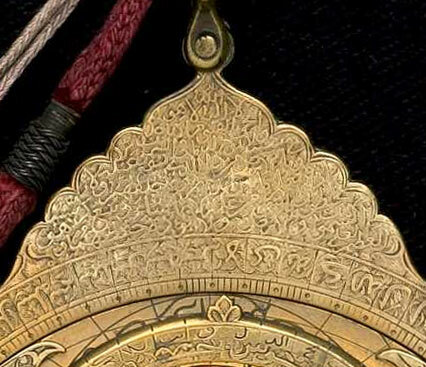 The top part of an astrolabe, which connects the suspension ring and the circular rim, is known as the throne, and this Qur'anic verse is often engraved there.